Companies implement new technologies in their welding operations for any number of reasons — to gain greater productivity and improve weld quality, or to save money or improve the health and safety of welding operators. Switching to a new wire is a cost effective change to make and can have significant advantages for the overall welding operation. A change could mean better productivity, reduced costs and improved safety, and isn’t that every welder’s dream. As with any change in the welding operation, converting welding wires should not be undertaken without careful planning or without reason. WIA’s End Market specialists can help with assessment and comparisons of welding wires along with implementation. Below are list of goals and questions that will help to determine whether you should consider making a change. Specific welding wires offer higher deposition rates and travel speeds, which can help increase productivity. Are you using the wire that offers the best productivity? You may want to consider a wire change to improve weld quality and reduce or eliminate re-work. Are you dealing with quality issues? Workplace health and safety is important. Today many companies are looking to reduce weld fumes in aim to better the work environment and to protect employees. Can you improve workplace health and safety? Cost can be a factor in a welding wire change. It’s also important to consider that some products, like metal-cored wires, can cost more upfront but offer long-term savings by increasing travel speeds, reducing spatter and minimizing pre-weld cleaning, especially compared to solid wires. These benefits can result in greater productivity, fewer instances of rework, less time for grinding before welding and a better bottom line. Is the wire you are currently using the most cost effective in the long run? If you answered no to the above questions or are unsure of the answer, then you might want to take the next step and consider a change. 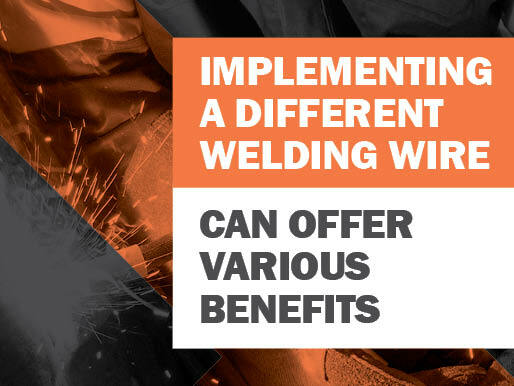 With thoughtful planning and consideration, a welding wire change and productivity implementation can accurately measure and improve productivity, quality and cost savings. Making the decision to change the welding wire or process, however, is not easy. Continuous evaluation of the overall operation is needed to ensure changes are producing desired results. This is where the WIA End Market Specialists can help. They will work closely with you, manage the entire testing process, and make a selection that will offer the best results for your application. What WIA’s End Market Specialists can do for you! WIA’s End Market specialists have the qualifications, experience and knowledge that can be relied on to deliver the best results. To help implement the most suitable wire for your application the first step is to book a consultation. From there our End Market specialists will assess your welding process and wire selection, do extensive in-house testing, record and document the findings and select the right wire for your job. But it doesn’t end there, our End Market Specialists will then train welding operators on how to get the most out of the chosen wire. Get in touch with one of our End Market Specialists Today!